Imperial Tobacco has blamed a slump in cigarette sales on regional instability caused by the Islamic State (IS, formerly ISIS/ISIL) in the Middle East. The UK tobacco giant, which owns global brands such as Golden Virginia and Gauloises, said 2 percent of the 5 percent fall in sales in the last quarter was due to “the deteriorating political and security situation” in Iraq. Imperial Tobacco claim that land grabs by the Islamic State (IS, formerly ISIS) in northern Iraq have caused distribution problems, making it harder to get cigarettes to the areas. While the Bristol-based company saw an overall decline in sales, its ‘growth’ brands – including Gauloises Blondes and Davidoff – sold 12 percent more. The FTSE 100 firm’s profits also dipped by 2 percent to £959 million ($1.46 billion). “Trading reduced significantly against a backdrop of a worsening political and security situation in territories where we have a high presence,” Imperial Tobacco’s earnings report read. The IS enforces strict anti-cigarette and alcohol laws in the territories it controls, according to reports from Raqqa, the group’s de facto capital. 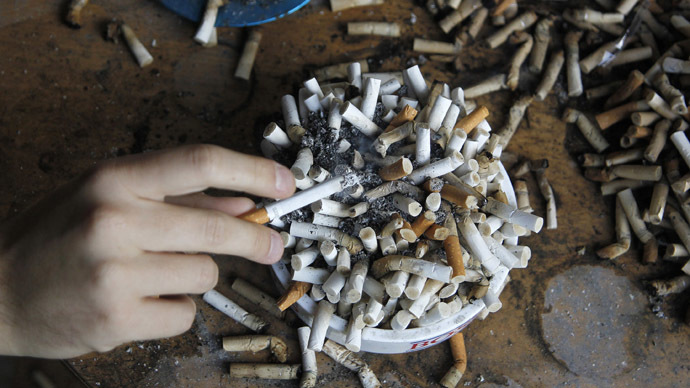 Anyone caught smoking a cigarette could face public flogging, huge fines or even execution. A founder of Raqqa is Being Slaughtered Silently (RBSS), Abu Mohammad Hussam, told the Independent: “The first time he will be arrested and flogged (40 lashes). A senior figure in the IS police force was found decapitated in Syria in February, allegedly with a cigarette left in his mouth. The words “O Sheikh this is munkar” were written on his body, translated as “this is evil, you Sheikh,” according to the British-based Syrian Observatory for Human Rights. Imperial Tobacco may face trouble in its home market also, as the Labour Party has pledged to introduce a new levy on cigarette makers if it wins the general election on Thursday. The company has said the windfall tax, which Labour leader Ed Miliband says will pay for cancer tests for NHS patients, will be passed on straight to customers. Chief Executive of Imperial Tobacco Alison Cooper said “We know little about it, but this looks like a quasi-increase in excise so we would have to pass it on. Despite regional instability in the Middle East and the prospect of increased taxes in the UK, Imperial Tobacco has seen its share price increase steadily over the past year. The firm is currently awaiting permission from US regulators to acquire two American tobacco companies, Reynolds and Lorillard. Business pundits expect the merger to be given the green light by US anti-trust enforcers, a move which will see Imperial attain around $7 billion worth of assets.